So...I don't really drink coffee. I know, I know, you think I'm weird or crazy or both. I'm just more of a tea person okay?? I'll just go...wander off into that corner over there. Whenever I go to coffee shops I always get iced tea or an italian soda if they make them—peach preferably. 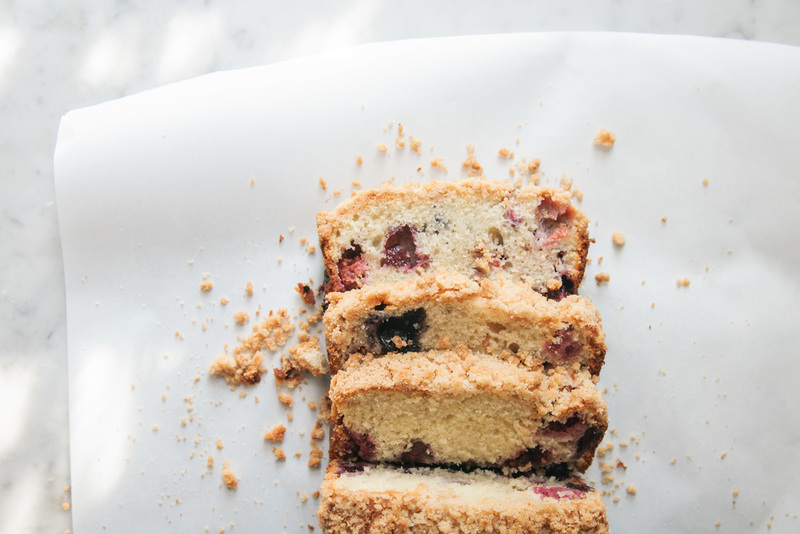 And on occasion, if I really feel like treating myself, I'll get a slice of coffee cake. A few years back, I would visit Starbucks frequently and only ever get three things there. Passion tea, asiago bagel with two portions of cream cheese, and their reduced fat (how unfortunate, but there was no other option) very-berry coffee cake. I do say, this homemade version is better, maybe because it's fresher, or maybe because it's loaded with butter and sour cream. Making this recipe has also reminded me of my wicked love affair with any kind of cake you can bake in a loaf pan. Coffee cake, pound cake, banana bread, zucchini bread. When fall rolls around I'm sure I'll be whipping up at least a few batches of pumpkin bread. However, we're still getting berries around here, so I'm taking advantage of that until it ends. Use the freshest berries you can get. The firmer they are, the better they'll hold up when you fold them into the batter. In a medium mixing bowl, whisk together sugar, flour, cinnamon, and salt. Add butter and work it in with your fingers or a fork until the mixture is crumbly like moist bread crumbs. 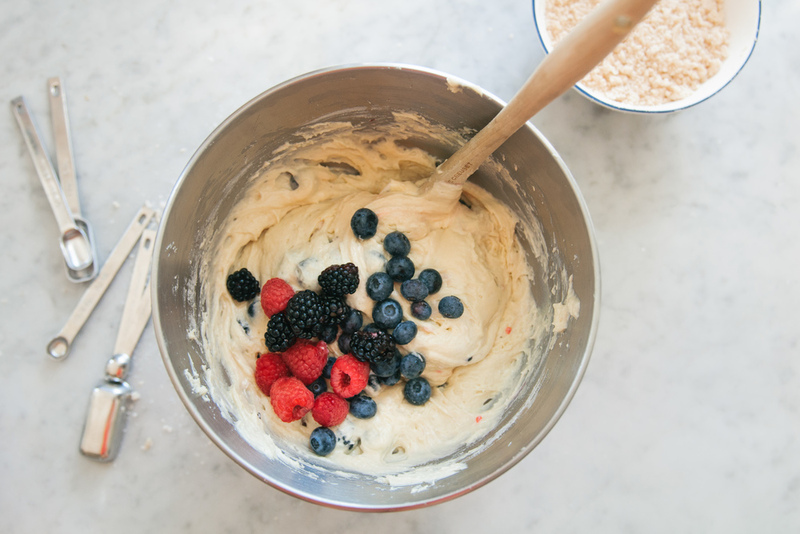 Set aside while you make the cake batter. Preheat oven to 350 degrees F. Generously butter a large loaf pan (mine was 5 & 1/2 by 10 inches). In a medium bowl, whisk together flour, baking powder, baking soda, and salt. In the bowl of a stand mixer, beat butter and sugar with the paddle attachment until light and fluffy, 4 to 5 minutes. Beat in eggs one at a time, scraping down the bowl after each addition. Add sour cream and vanilla, and beat for 1 more minute. Add the dry ingredients and beat on low until just incorporated, about 30 seconds, making sure not to overwork the batter. 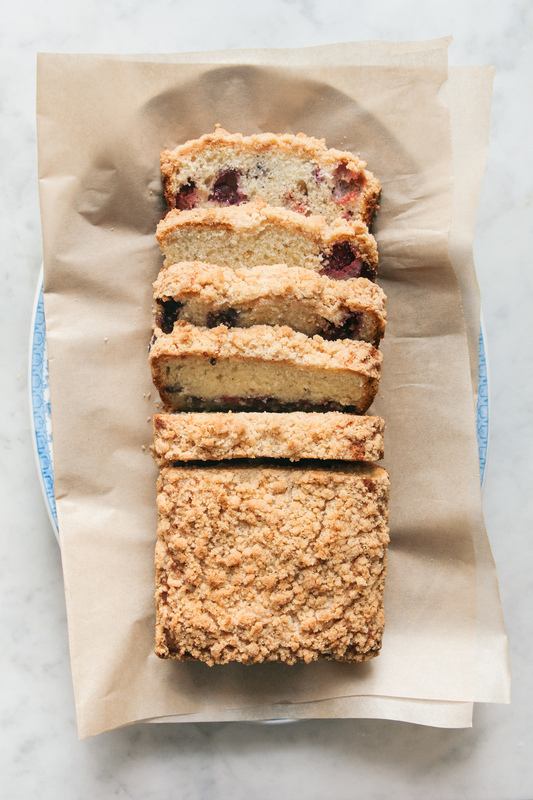 Gently fold in the berries, transfer to a loaf pan, and top with streusel. Bake for 55 minutes to an hour or until a toothpick inserted comes out clean. Let cool to room temperature before serving.